A passion for popular music and making videos have helped UBC harp student Samantha Ballard tap into unconventional—and large—audiences. Samantha Ballard’s arrangements of tunes from Game of Thrones and How to Train Your Dragon have attracted attention from popular and classical audiences. Using social media platforms such as YouTube, Facebook and Twitter, Ballard has developed tools to showcase her talents and connect with potential employers. I recently sat down with Ballard to discuss her tech-savvy approach to building a career. You have a great online presence. As a performer, why did you decide to embrace social media such as YouTube? YouTube wasn’t a decision I made as a performer; I started out as a fan. I was looking up harp covers of music from the Legend of Zelda series and there was one song no one had done. I thought, “I could do that.” And it really went from there. Most of what I put up on YouTube are covers of pop music—namely video game and TV music. Fans of games, shows and movies are passionate about their associated music, and I think it’s an audience that a lot of classical musicians tend to ignore. Why is social media an important tool as a performing artist? Social media is incredibly important: it’s where everyone is. Clients, audiences, employers. You can open up opportunities just by being online where people can find you. A YouTube channel can build an online portfolio of your work. Twitter, Facebook, Instagram and Tumblr can all be used to announce performance dates and upcoming albums, and provide an inside look at the life of a working musician, which can keep people interested. I heard you were also part of the UBC Laptop Orchestra, which recently performed and conducted research in Belgium. What inspired you to sign up? Not going to lie, the trip to Belgium was a big motivator for me. But I also joined because I really didn’t know anything about electroacoustic music. Now a whole new genre has opened up for me and I actually get it now. 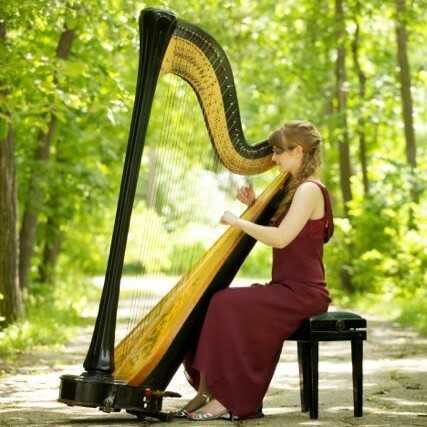 How has learning about electroacoustic music influenced your development as a harpist? I think that more than anything, learning about electroacoustic music has taught me to keep an open mind. Just because you don’t understand something doesn’t mean it’s not good. When did you start playing the harp? How did you get into it? When I was fifteen, I wanted to pursue a career in music and decided that harp would make a good career. It worked out fairly miraculously! I don’t think I realized what a gamble I was making at the time—but I guess there’s a lot to say for not considering that failure could be an option. Read more about Ballard and other insanely talented folks in High Notes, the UBC School of Music’s new online magazine.